Offering you a complete choice of products which include ceramic seals. We are a highly esteemed Ceramic Seals Manufacturer and Exporter from India. 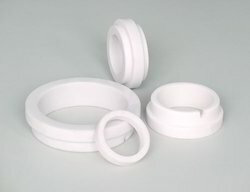 We offer Ceramic Seals that are extensively used for averting back-flow and keeping pressure under control. Bellow Seals are manufactured using high quality material and that is why they are capable of giving high performance. Our Bellow Seal is in high demand by national and international clients for its unmatched quality. It is used in Chemical industry, Petrochemical industry, refineries and Polymer industry. Due to its impressive features like finest sealing performance, precise dimensions, simple installation and easy removal it is highly demanded. Our exclusive range of Bellow Seals includes Elastomer Bellow Seals and Metal Bellow Seals. Looking for Ceramic Seals ?